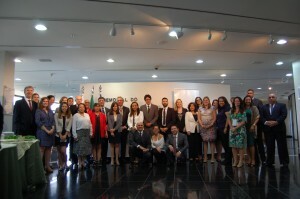 During the week of November 30 to December 4, 2015, AIPR helped to carry out two activities of great importance in Brasilia, Brazil. 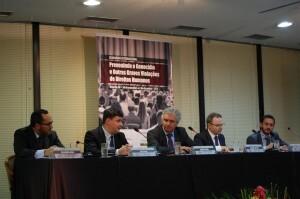 The Seminar on the Prevention of Genocide and other Grave Violations of Human Rights opened the programming, organized by the Federal Attorney for Citizen’s Rights of the Office of the Prosecutor General of the Federal Public Ministry and by the Secretariat of Human Rights, in collaboration with the Auschwitz Institute for Peace and Reconciliation and the United Nations Office of the Special Adviser for the Prevention of Genocide. The Seminar’s inaugural panel was made up of Rogério Sottili, Special Secretary of Human Rights of the Ministry for Women, Racial Equality, and Human Rights, Aurelio Ríos, Federal Prosecutor for Citizen’s Rights, and Dr. Tibi Galis, Executive Director of the Auschwitz Institute for Peace and Reconciliation. Each one of the representatives stressed the importance of continuing to promote an agenda of human rights and atrocity prevention, emphasizing that educative and reflective activities, such as the International Seminar, are necessary lines of work in the process of strengthening this agenda. Delivered to an audience of 50 attendees over the course of three days, the Seminar was comprised of contributions from internationally and nationally renowned speakers who discussed policies of prevention with a specific focus on memory, truth, and justice, the role of security forces. Participants also spoke about the preservation of peace and the advancement of the fight against discrimination as well as triggering factors of violence against young black citizens and the indigenous population. 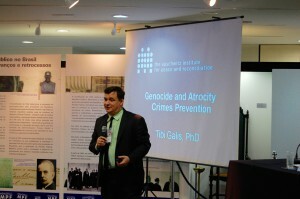 AIPR’s Executive Director, Dr. Tibi Galis give a presentation on the topic of Genocide and Mass Atrocity prevention, which included s a historical overview of the development of the contemporary understanding of genocide. Dr. Galis then participated in a panel discussion alongside Luciano Mariz Maia, Vice Federal Prosecutor for Citizen’s Rights at the Federal Public Ministry, which was moderated by the Director of AIPR’s Latin America Program, Eugenia Carbone. On Thursday, December 3, the V Meeting of Focal Points of the Latin American Network for Genocide and Mass Atrocity Prevention began, also taking place in the city of Brasilia. In its role as Technical Secretariat of the Network, AIPR co-organized the event with the Office of the Federal Attorney for Citizen’s Rights and the Secretariat of Human Rights. The meeting continued through Friday, December 4, and, as had been planned, functioned as the preferred framework for publicizing the national initiatives developed during the year of 2015 and those planned for 2016. Additionally, participants analyzed and established steps to follow in relation to projects that are being developed under the framework of the Latin American Network and agreed upon future joint actions to continue with the progressive consolidation of the Network. Echoing the spirit of the Resolution of the General Assembly of the United Nations which established December 9 as International Day of Commemoration and Dignity of the Victims of the Crime of Genocide and of the Prevention of this Crime, the Latin American Network for Genocide and Mass Atrocity Prevention, meeting in Brasilia during its V regular meeting, joins in commemorating the victims and reiterates its conviction that the preservation of historical memory and work towards the prevention of this crime are effective means to honor and commemorate the memory of all those affected.